The best choice for an authentic Victorian country garden. One sniff of this stock's luxuriant fragrance will leave you utterly enchanted. 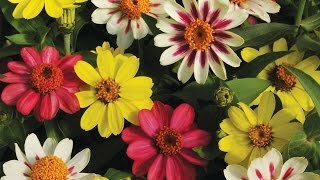 With its wonderfully sweet fragrance and vibrant, full colors, this stock is the best choice for an authentic Victorian country garden. A balanced mix of deep violet, rose shades, purple, pink and white. Prefers cool weather. Plant in the garden after all danger of frost has passed. Select a location in full sun in a rich, moist, well-drained soil. Stock requires cool temperatures to flower and will not form new blooms when temperatures rise above 65 degrees F.
Tall cultivars may need staking, although the stems are generally strong. Stock is useful for beds, borders, and containers, but is best grown for cutting and for its exquisite fragrance. Stock is an ideal choice for a cottage garden. Grow tall cultivars in a cool greenhouse for winter cut flowers. Stock, Harmony Mix is rated 3.0 out of 5 by 2. Rated 1 out of 5 by Nancyt from Tried, but no success I planted my seeds in my front flower bed where they got full sun all day, and I never seen any come up. Greatly disappointed, especially since I planted them for my mother who loved these plants when she was alive. Rated 5 out of 5 by Yearroundgardener from Wonderful fragrance I am growing these under lights this winter in a garage window with 50F minimum night temps and 70F maximum day temps. They grow quickly and were beginning to bloom in 40 days. Now at 55 days the full blooms have great colors and a wonderful fragrance. They love cool temperatures.